This paper explores the thermal design and robotic construction of high-performance building components. The complex surface geometry of these components actuate specific thermal behavior in passive building systems through implementing the principles of convection in thermal mass. Our seamless design-to-fabrication workflow uses optimization methods that combine measured thermal data and simulation feedback with advanced modeling and emerging robotic manufacturing techniques. 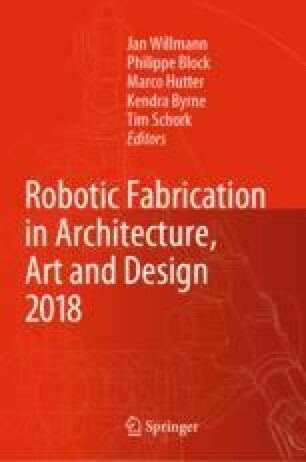 Bridging an understanding of thermal performance, geometry, and manufacturing we suggest direct formal relationships between the behavior of airflow to tool-path planning for a robotic arm. This paper will focus on describing an experimental process we term Profile-3D-Printing that demonstrates a novel approach to the construction of concrete panels with complex surface geometries. This hybrid construction method combines material deposition with tooled post-processing to achieve high-resolution surface definition. The process entails automated delivery of material for selective deposition of panel geometry, and tooled shaping of rough and finish layers for the physical production of computationally generated forms.